"It is an interesting project and a great achievement. This proves that it is possible to produce salmon in the desert - and in theory everywhere depending on the investment costs of course" says Jacob Bregnballe, Sales Director in AKVA group Land Based AS. Fish Farm LLC, headquartered in Dubai, UAE, has set up an inland farming facility in Jebel Ali - a short drive outside Dubai. 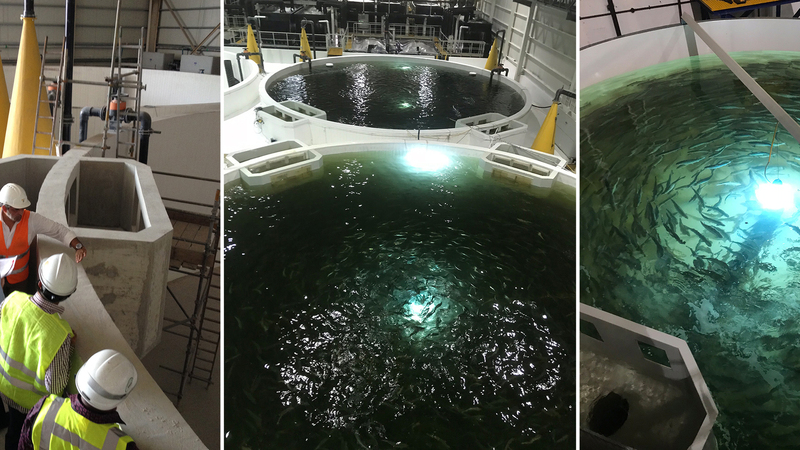 The farm is built in an existing building, and the fish bred in a controlled environment in a recirculation aquaculture system (RAS) - all from AKVA group - including Akvasmart CCS feeding system, AKVAconnect software and more. "The sea water originates from the Persian Gulf outside Dubai and the system is cooled to the desired temperature. The water consumption is reduced with 99 per cent compared to a normal flow-through system," says Bregnballe. “Until today, to taste salmon as fresh as ours in the UAE was simply an impossibility. The only way to have this experience was to travel to Scotland, Ireland, Norway or Chile to catch a fish and eat it within a few hours. But not any longer. We have turned the impossible into a reality: We can even deliver the fish alive," says Nigel Lewis, Aquaculture Development Manager in Fish Farm. “There is huge demand here, and if we lost two of those species, we would have a food security problem,” bin Mubarak says. “We have the freshest, best salmon available here, it is 100% traceable, sustainable, free from chemicals and antibiotics and totally conforms with the strategic Food Security criteria for UAE," Nigel Lewis says.